Scarlet fever is a bacterial infection characterised by a rough, red rash that starts on one part of the body and then spreads to other areas. Other symptoms include fever, itchiness, flushing in the face and a red, swollen tongue. Although scarlet fever can affect anyone, it most commonly occurs in children between two and 10 years of age. In most cases, scarlet fever follows a sore throat (streptococcal sore throat) or school sores (impetigo). These conditions are all caused by group A Streptococcus bacteria. A toxin produced by these bacteria circulates in the blood to cause the characteristic rash of scarlet fever. Droplets of body fluid containing group A Streptococcus bacteria are spread from one person to another by coughing, sneezing or sharing food, drinks and personal items. For this reason, the condition often spreads in crowded environments, such as day care centres and schools. Symptoms usually appear within one to four days of coming into contact with an infected person. In the past, scarlet fever was considered to be a serious childhood disease. However, it is now easily treated with antibiotics. Once the infection has cleared, immunity develops and it is rare for scarlet fever to return. Symptoms of scarlet fever appear within about four days of coming into contact with an infected person, usually starting with a sore throat, headache and fever. About 12 to 48 hours later, the characteristic rash begins to show. A few spots generally appear in one place, before turning into a rough, pink-to-red rash that looks like sunburn and feels like sandpaper. The rash rapidly spreads to other areas such as the neck, chest, ears, thighs and groin. Although the cheeks may become flushed, the rash doesn’t usually spread to the face. In most cases, the rash fades within about a week, but the skin may continue to peel for a number of weeks, particularly on the hands and feet. 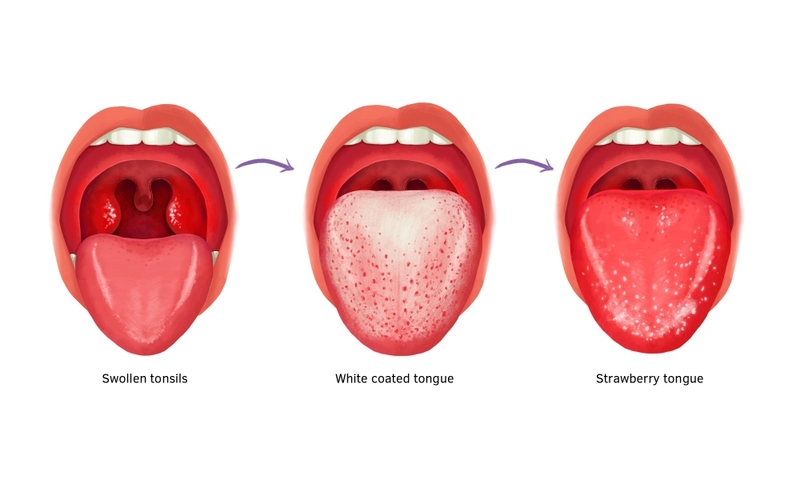 Development of the strawberry tongue associated with scarlet fever. Scarlet fever is caused by group A Streptococcus bacteria that live in the nose and throat. This group is also known as group A beta-haemolytic streptococcus (GABHS) or Streptococcus pyogenes. The condition is spread by breathing in droplets of fluid that have been sneezed or coughed out by an infected person. Similarly, the bacteria can be passed on by touching the skin of someone with group A Streptococcus infection, or by sharing contaminated towels, bed linen or clothing. Group A Streptococcus bacteria produce a harmful substance called erythrogenic toxin. This toxin travels around the body in the blood, triggering the release of natural inflammatory chemicals. The characteristic skin rash and red tongue of scarlet fever are the result of general inflammation and a widening of the blood vessels (vasodilation). However, not everyone is prone to scarlet fever. For example, if two children from the same family become infected with group A Streptococcus bacteria, it is possible that only one (or neither) will develop scarlet fever. This also means that some children can carry the bacteria and pass on scarlet fever without developing any symptoms themselves. Being prone to having Streptococcus bacteria living in your throat. Scarlet fever is usually diagnosed by looking at symptoms, particularly if a rash is present. Your doctor may also look closely at the throat and glands. A throat culture may also be performed to look for Streptococcus bacteria. During this procedure, the throat and tonsils are gently rubbed with a sterile cotton swab. This swab is then processed to confirm the diagnosis. In some cases, a blood sample may also be collected to rule out other potential causes of rash and sore throat. To relieve pain and fever, your doctor may suggest over-the-counter medications, such as paracetamol and ibuprofen. Similarly, calamine lotion or an over-the-counter oral antihistamine medication may be recommended to reduce itching. For an associated sore throat, saltwater gargles, soothing liquids or medicated lozenges that cool or numb the throat may be helpful. Plenty of water and rest can help the immune system to naturally fight the bacterial infection. Although the symptoms of scarlet fever are usually mild and will clear on their own within 7-10 days, Streptococcus bacteria are likely to remain if the infection is not treated. To reduce the risk of complications or further spread of infection, antibiotics are prescribed when Streptococcus bacteria infection has been confirmed. The most common antibiotics for scarlet fever are oral penicillin or amoxicillin over a course of 10 days. Less frequently, erythromycin may be prescribed if an allergy to penicillin exists. Once treatment begins, symptoms generally start to ease within a day or two. Children can usually return to school 24 hours after starting antibiotic treatment. Some signs that the infection has spread include fever, increased heart rate, rapid breathing, vomiting and confusion. Seek urgent medical attention if any of these symptoms occur. In rare cases, group A Streptococcus bacteria can cause ongoing activation of the body’s immune system, weeks after scarlet fever has cleared. This subsequent condition, known as rheumatic fever, leads to inflammation in other areas of the body, including the joints, skin, heart and brain. Rheumatic fever often causes lasting damage to the heart valves (endocarditis), but not to other affected areas of the body. In a similar way to rheumatic fever, an ongoing immune response to group A Streptococcus bacteria can lead to inflammation of the kidneys, known as post-streptococcal glomerulonephritis. Again, it generally occurs a few weeks after scarlet fever has cleared. Symptoms of post-streptococcal glomerulonephritis include blood in the urine, a puffy face and swollen feet and ankles. However, it usually clears on its own within a week without causing any lasting damage. For this reason, this condition is considered less serious than rheumatic fever, even though it occurs more frequently. In rare cases, the toxin produced by group A Streptococcus bacteria can cause a condition known as toxic shock syndrome, or TSS. This state of ‘shock’ is characterised by a sudden fever and extreme drop in blood pressure (hypotension). These symptoms may occur together with dizziness, confusion, vomiting or diarrhoea. If left untreated, the toxins may also damage the skin and organs. However, there is a good chance of recovery if the condition is diagnosed and treated early. The outlook for scarlet fever is usually very good, particularly when the condition is correctly diagnosed and treated early with antibiotics. In most cases, the condition clears within about a week of starting treatment and complications are rare. Scarlet fever is usually contagious in the two days before symptoms appear, up until one or two days into treatment. Even when left untreated, the fever usually ends quite suddenly after about five days. The rash generally fades and then begins to peel about a week later. However, it may take several more weeks for the throat to return to normal, during which time it is still possible to pass on the infection. Scarlet fever may be prevented by avoiding contact with people who have a sore throat or skin infection caused by group A Streptococcus bacteria. If contact cannot be avoided, the likelihood of developing scarlet fever may be reduced by maintaining good hygiene measures. Teaching children good habits, such as washing hands and covering their mouths with a tissue or the inside of the elbow when coughing or sneezing, can also help to prevent the spread of infection. Keeping children with scarlet fever away from organised activities, such as childcare or school, is usually recommended until they are no longer contagious. Replacing toothbrushes after starting antibiotic treatment can also reduce the possibility of reinfection of the throat. Similarly, taking the full course of antibiotics prescribed by your doctor may help to limit further spread of Streptococcus bacteria.